Tens of thousands of Texans live in places where the drinking water contains toxic levels of arsenic — a known carcinogen — and the state isn’t doing enough to discourage them from consuming it, according to a new report from an environmental group. Analyzing state data posted online, the Washington D.C.-based Environmental Integrity Project found that 34 rural drinking water systems serving about 51,000 Texans have exceeded the federal drinking water limit for arsenic for at least a decade — many by a long shot. The report, titled “Don’t Drink The Water,” also found that Texas requires public water utilities to use less urgent language than some other states in the notices they send to customers when their drinking water exceeds the arsenic standard. Since 2006, the federal Safe Drinking Water Act has required the nation’s public water systems to limit arsenic levels to 10 parts per billion — down from 50 parts per billion previously. Most of the public water systems cited in the Environmental Integrity Project report, published Monday, have long-term average arsenic concentrations of 10 to 20 parts per billion, although some are much higher. For the past two years, for example, about 650 people in the South Texas town of Bruni have received drinking water containing more than 80 parts per billion of arsenic, which is known to cause lung, kidney and other types of cancer. The inorganic contaminant, which has no distinct taste or smell, is widespread in soil and groundwater in much of the world. However, state officials say the arsenic levels cited in the report do not pose an immediate health threat because the federal drinking water standard for arsenic is overly cautious. Arsenic levels in drinking water “are higher than we’d like for them to be and that’s why we’re working to get them below the standard, but it’s not a ‘Stop drinking your water’ issue,” said Michael Honeycutt, director of the toxicology division at the Texas Commission on Environmental Quality (TCEQ). Studies show that “if you start getting above 100 to 150 parts per billion, that’s when you start to see the health effects,” said Honeycutt. He said he wouldn’t have a problem drinking the water in Bruni but added that “it might not taste very good” because water in that part of the state has higher levels of particles and pollutants. Last year, the TCEQ renewed its contract with a Massachusetts consulting firm to scrutinize the true health risks of arsenic; Gradient previously had helped the agency build a case questioning the public benefits of reducing smog levels in Texas cities like Dallas and Houston — benefits that the vast majority of experts say would be significant. Gradient is expected to deliver a report in late July, Honeycutt said. The Environmental Integrity Project report says new evidence suggests that the cancer risk associated with arsenic may be much higher than previously thought, noting that the EPA currently is revising its assessment of cancer risks to account for more recent science. “A 2010 draft of the assessment indicated that the risk of getting cancer from drinking water containing 10 (parts per billion) of arsenic is closer to 1 in 136, more than 17 times higher than current assumptions,” the report says. The EPA’s current assumptions are that the risk of developing cancer after drinking water containing 10 parts per billion of arsenic over a lifetime are 1 in 2,000. Many scientists say the increased risk of cancer in humans who drink water, inhale dust or ingest soil contaminated with high levels of inorganic arsenic puts the chemical’s danger level in the same category as that of smoking cigarettes. The arsenic concentrations cited in the report "needless to say represent a threat to public health,” said Houston environmental toxicologist Stephen King, noting links to cancer, cardiovascular disease, respiratory and other health issues. "This is significant and my recommendation is that anyone drinking water with an arsenic concentration at 10 (parts per billion), should not drink the water" or use it to prepare food. Regardless of the exact health risks associated with arsenic, Environmental Integrity Project Director Eric Schaeffer said they are indisputably high enough that people whose drinking water exceeds the federal limit — particularly pregnant women and children — should receive notices that encourage them to seek alternate sources of water. "This isn’t about whether it’s illegal for somebody to keep drinking out of their tap, but it’s about what they should be advised to do, and I think people take public health advisories fairly seriously, if they’re clear enough," he said. 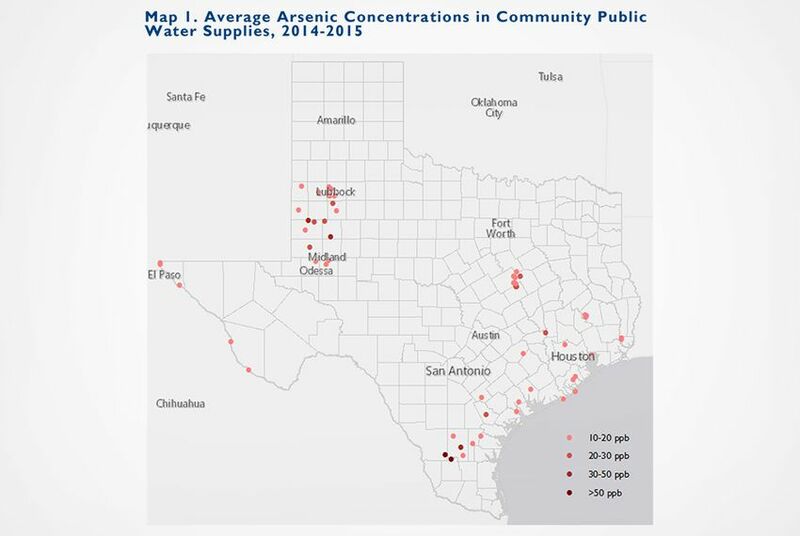 The notice that Texas currently requires public water utilities to send out in the event of high arsenic levels says, "This is not an emergency." That language is recommended by the EPA and most states employ similar or identical language, said Honeycutt, who believes it is adequate. Changing it would require EPA approval, said Linda Brookins, director of the TCEQ's water supply division. The Environmental Integrity Report also places onus on the EPA for not requiring states to do more. It found that a handful of states, including Florida, Michigan and Maine, voluntarily require public water utilities to send notices that specifically discourage consumption of water containing high levels of arsenic. The rest likely do not go that far because they are not required to and don't want to be bearers of bad news, Schaeffer said. Seeking an alternate source of water can be difficult and expensive, he acknowledged, explaining that you can't get rid of arsenic by boiling it. But he said people have the right to know so they can at least try to act.